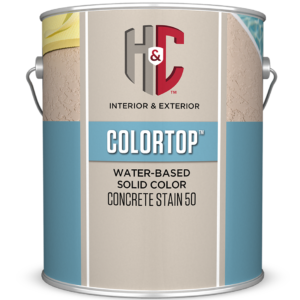 A LOW-VOC VERSION OF COLORTOP™ SOLVENT-BASED FOR VOC RESTRICTED AREAS. Substrate* sq ft/gal Concrete floors 200-250 Porous concrete 150-200 Concrete block 125-150 Split-faced block 100-125 Fluted block 75-100 Brick (clay) 100-150 *Coverage will vary depending on the porosity and texture of the substrate. 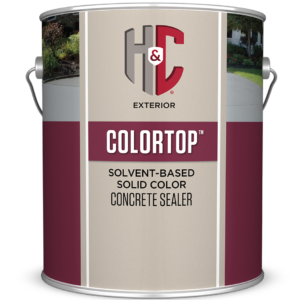 H&C® COLORTOP™ 250 SOLVENT-BASED SOLID COLOR CONCRETE SEALER is H&C®’s Low VOC Solvent-Based Sealer that provides a durable finish that extends the life of concrete and masonry surfaces. 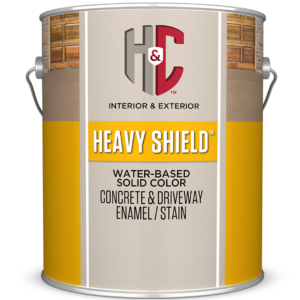 It penetrates deeply into the surface to form a tough shield, so it won’t peel, fade or flake over time. It’s resistant to salt, acids, alkalis, water, UV rays, oil and heavy traffic. Create a beautiful and expensive-looking landscape that is completely unique. 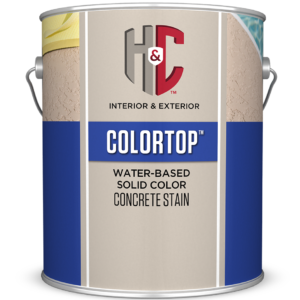 Choose from our pre-mixed or custom-tinted colors.